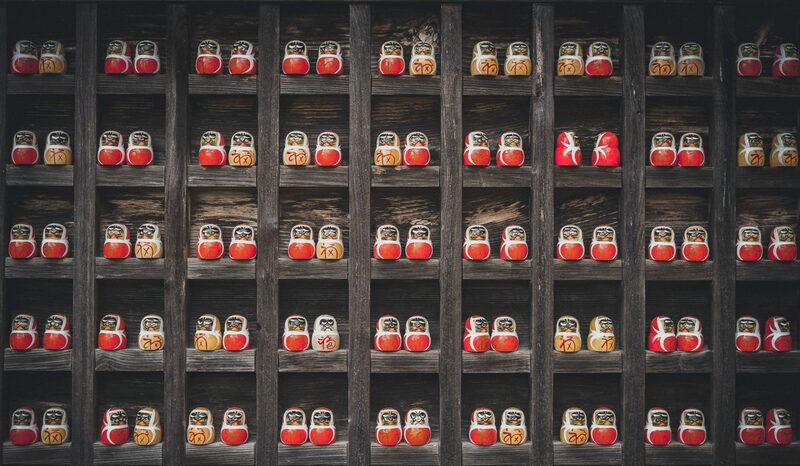 It’s not surprising that alternatives appeal to pension funds. The average fund in the Pew study hopes to generate an annual return of 7.5 percent. With interest rates at historic lows, bonds are unlikely to deliver. Stocks have a better chance, particularly in more reasonably priced markets outside the U.S. But stocks are also riskier, and that risk is unnerving to pension funds desperate to avoid shortfalls. Enter alternatives, a seemingly perfect, well, alternative. For much of the period between 2006 and 2016, the trailing returns of private assets and hedge funds were enticingly higher than those of stocks. 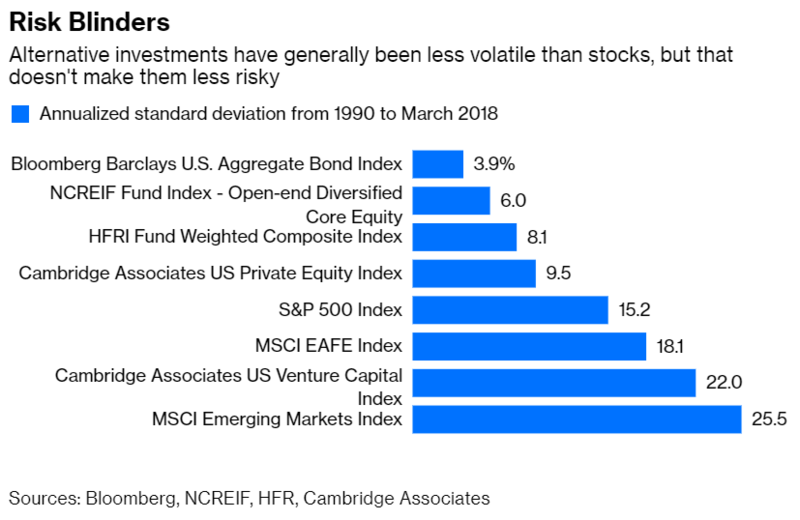 And given that investments in private assets and some hedge funds are not marked to market, and that many hedge funds wager both long and short bets, the volatility of alternatives looks more like that of bonds than of stocks. Stock-like returns with bond-like risk. Problem solved. Except it’s not that easy. For one thing, volatility is a useful proxy for risk when it comes to stocks and bonds, but not so for alternatives. It’s nonsensical to believe that investments in startups or leveraged buyouts or those tied to commodity prices are less risky than the broad stock market. Or that the muted volatility of hedge funds fully reflects the risk that their long and short bets could simultaneously sour. A more sensible assumption is that alternatives are as risky as stocks, and in many cases riskier, despite their lower volatility. A more obvious pitfall is cost — and there’s no doubt that alternatives are more expensive than stocks. The 2-and-20 fee structure — 2 percent of assets and 20 percent of profits — is still the norm in venture capital, private equity and other private assets. Hedge fund fees have dropped closer to 1.5 and 15, but that’s still more expensive than actively managed stock mutual funds, whose fees generally range from 0.5 percent to 1 percent depending on the strategy. And let’s not forget the huge variety of stock index funds with fees approaching zero. 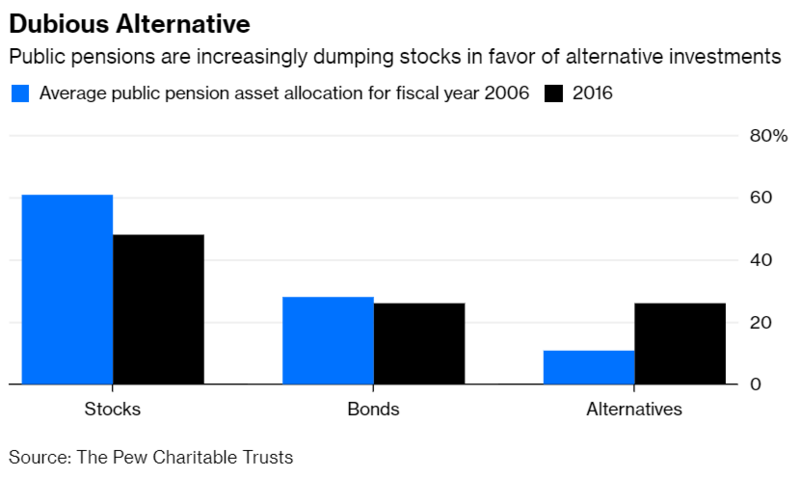 In fact, while Pew’s numbers don’t show how much pension funds pay for stocks versus alternatives, the available numbers suggest that alternatives take a bigger bite. There’s a positive correlation (0.57) between the funds’ allocation to alternatives and the fees they paid to external managers in 2016, but a negative correlation (-0.56) between their allocation to stocks and those same fees. In other words, a higher allocation to alternatives is associated with higher fees, while a higher allocation to stocks points to lower ones. In most cases, those higher fees don’t translate into higher returns. As I showed recently, the top 10 percent of hedge funds have produced stellar net-of-fee returns, while the rest have generally been mediocre or worse. The same is true of the top 25 percent of venture capital and private equity funds relative to others. But there’s far more pension money chasing alternatives than top managers can accommodate, never mind all the other investors competing for those same funds. There’s no reason to believe that the average pension fund would be better off with alternatives and good reasons to believe that it would most likely be worse off. By all means, those with access to the best funds should dabble in alternatives, but everyone else should stick with stocks.